February 6, 10:00 a.m. - 5:00 p.m.
February 7, 10:00 a.m. - 5:00 p.m.
February 8, 10:00 a.m. - 4:00 p.m. 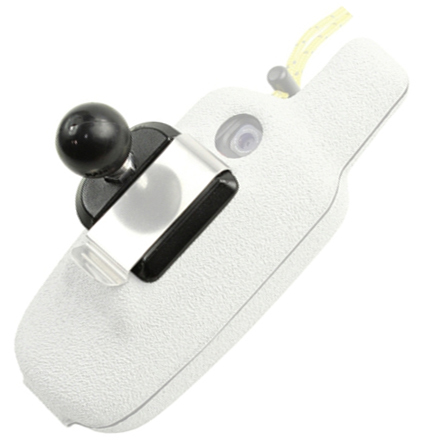 Protective Case for the FLIR C2 / C2-EDU Thermal Imaging Camera. Introducing a new GizzMoVest Protective Cover for the FLIR C2 / C2-EDU Thermal Imaging Camera. The FLIR C2 / C2-EDU has the ability to generate hybrid thermal images so interpretation of thermal images is easier than ever. Our GizzMoVest cover will help protect this amazing camera with the same tactile adhesion and screen-recessing features our GPS cases are famous for. The FLIR C2 in a GizzMoVest is an ideal combination for a wide array of users from Home Inspectors to Hunters to Factory/Facilities Managers and even Auto Mechanics. 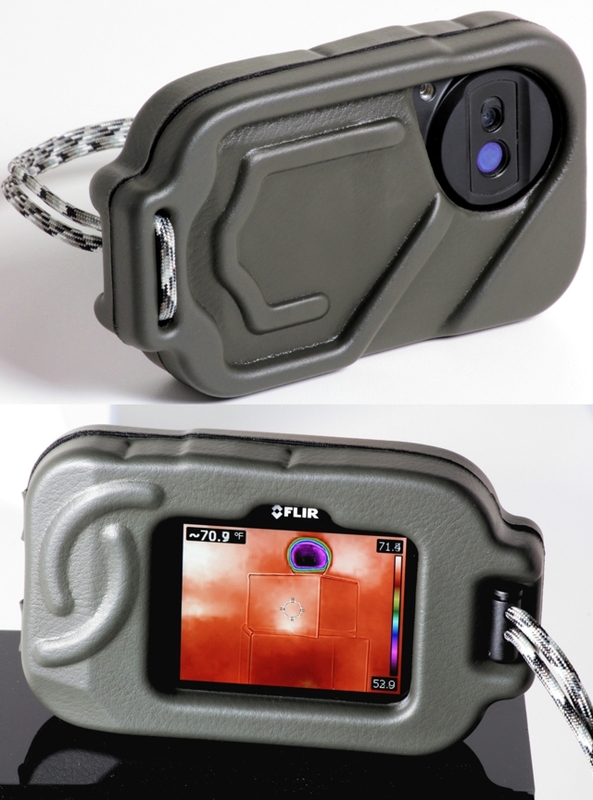 Protective Case for the FLIR ONE-iPhone 5 combination. 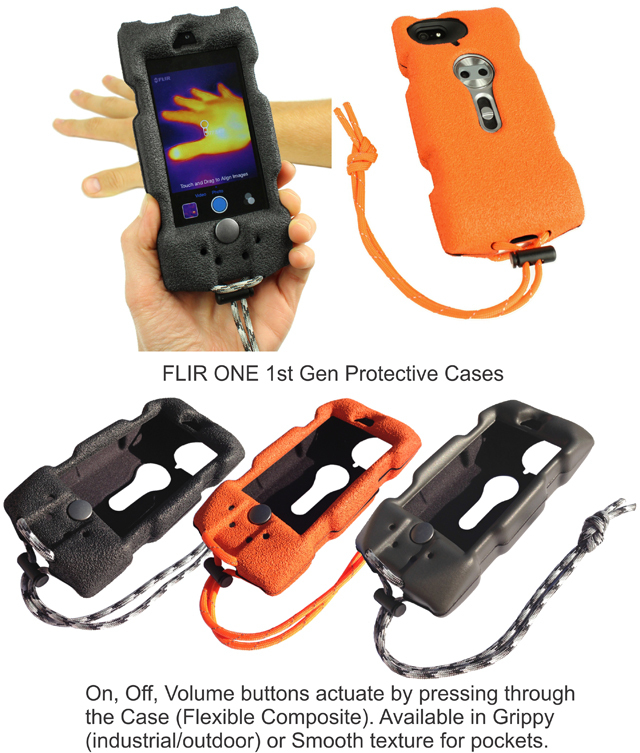 Introducing a new GizzMoVest Protective Cover for the FLIR ONE (Gen 1) Personal Thermal Imager for the iPhone 5. The FLIR ONE provides your iPhone with the ability to generate hybrid thermal images which combines a highly sensitive thermal image with an outline derived from a conventional digital camera so interpretation of thermal images is easier than ever. Our GizzMoVest cover will help protect this amazing combo product with the same tactile adhesion and screen-recessing features our GPS cases are famous for. The FLIR ONE in a GizzMoVest is an ideal combination for a wide array of users from Hunters to Facilities Managers. Equally at home on the factory floor or on a night hunt. New GizzMoVest for the Garmin RINO 610 and AA Packs. Rino 610 owners and Rino 650/655 owners who use the larger AA Battery Pack ( 010-11600-00 ) now have a GizzMoVest. Currently available in Coffee color with orange Wrist Lanyard. 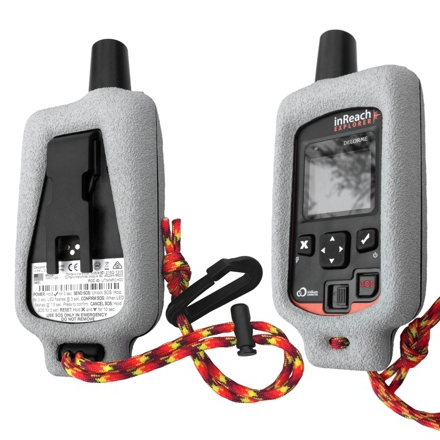 Delorme InReach EXPLORER and SE GizzMoVest is here. 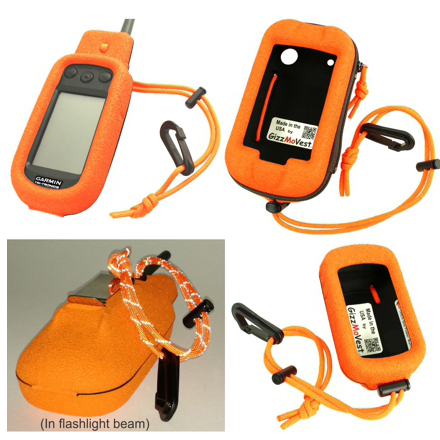 A special new GizzMoVest has been released for the Delorme InReach Explorer and InReach SE. Available only in a bright Lt-Grey with a bright Wrist Lanyard for even more visibility and contrast than the unit alone provides. This particular GizzMoVest adds modest floatation to the InReach so odds are much better that you would able to retrieve it if lost overboard. (Note: only certain GizzMoVest's add floatation). Recessing the Screen and providing superior GRIP wet or dry, This GizzMoVest is designed to complement and help protect the features of the InReach SE. 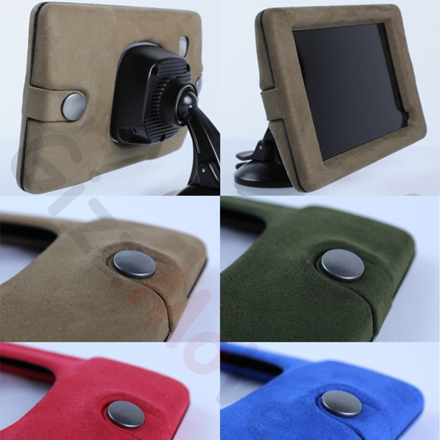 Split Suede Cool Case for NUVI 3597 and 3598 available now. 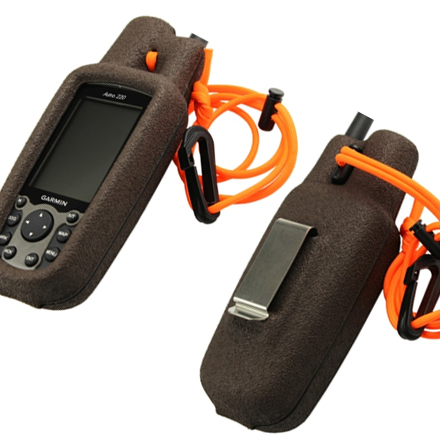 GizzMoVest technoloogy has been extended into new applications in the form of a Luxury Cover for the NUVI 3597 & 3598. Besides the stunning good looks of these split suede Covers are available in a range of colors. They will keep the flagship NUVI substantially cooler when on the dash of your vehicle and like all GizzMoVest's will recess the screen deeply for protection from ad-hoc storage. a 5th 'Apricot' color is also available. Oregon 600 / 650 GizzMoVest is available now. NEW RAM Mount Adapters for Belt Clip GizzMoVest's. 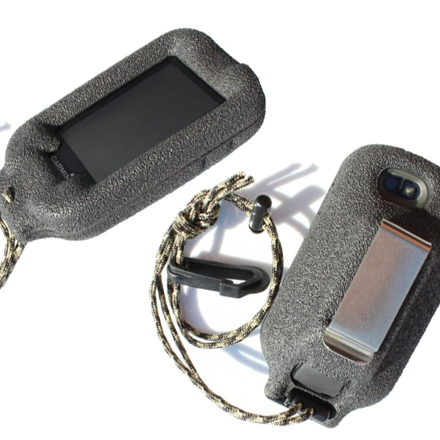 Apr 27, 2013 Goleta, CA USA: Now owners of Garmin Outdoor Handhelds have the option of combining the added protection of a Heavy-Duty Composite Case with a RAM Mount. 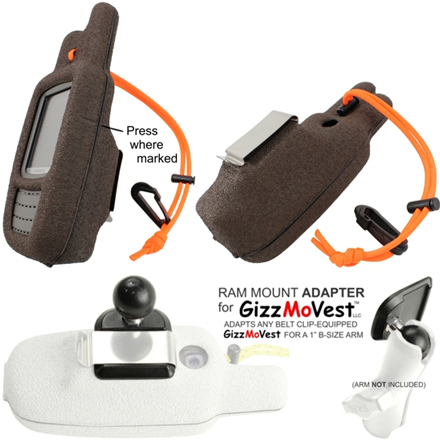 GizzMoVest's new low-cost Adapter Adapts ANY Belt Clip-equipped GizzMoVest that has ever been made to a RAM Mount 1" ('B' size) Socket or Arm. 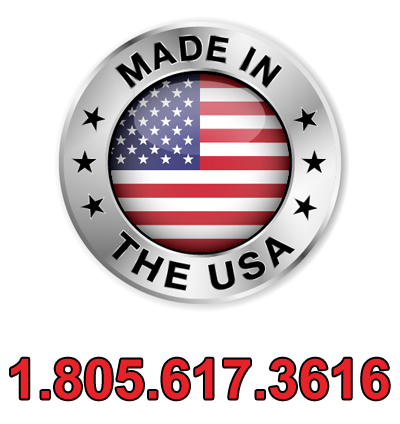 The Adapter is molded from virtually unbreakable HDPE and includes RAM Mount's RAM-B-337U (1" Ball) and anti-rotation Stainless Steel Fastener. Best of all, the Adapter STAYS WITH THE MOUNT, so you just unclip the GizzMoVest and go ! Available May 7th, 2013. *Form Verification: ENTER 71387 IN THE FIELD BELOW.